After you've added friends to your contact list, it's time to start chatting. You need to be logged in to Google Talk (which, in turn, actives your Internet connection, if it isn't already active), and have a friend who is also logged into Google Talk. Follow these steps to chat. 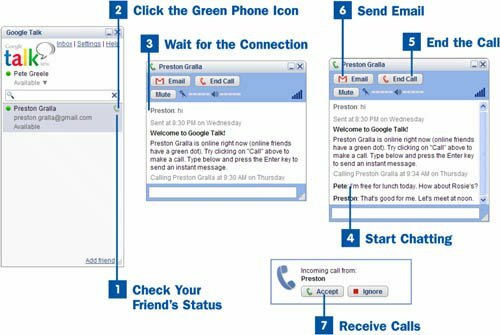 To chat with a friend, he needs to be online, so first check his status in your Google Talk contact list (launch and sign in to Google Talk to see the contact list screen). If your friend is offline and not available, the ball to the left of his name is grey, and an M icon appears to the right of his name. If the friend is online, the ball to the left of his name is green, and there is an icon of a green phone, rather than an M.
To confirm the status of your friend, hover your mouse over the ball to the left of his name in the contact list; Google Talk displays his statusOffline or Available. To initiate a conversation, click the green phone icon to the right of your friend's name in the contact list or double-click his name, and then click the Call button. You hear a dial tone sound, notifying you that you're contacting your friend. If your friend accepts the call by clicking Accept, the dial tone sound notification stops. At the top of the screen, you see your friend's name, and a hi message from him. That means he has accepted the call. If he doesn't accept the call or he ignores it (by clicking Ignore), you get a notification that the call wasn't answered. After the connection is made, type your message in the input box at the bottom of the screen and press Enter. The message is sent to your friend. When he responds with a message, it shows up just above the input box. You are able to see all your messages and his responses just above the input box. You can use the scroll bar on the right side of the screen to review the entire conversation. Sometimes a person shows up on your Google Talk friends list without you adding them. This isn't voodoo, but a feature of Google Talk and Gmail. Every time you send a Gmail message, the recipient's email address is added automatically to your Gmail contact list. Exchange a lot of email with that person, and he is automatically added to your Google Talk friends list. If you want to chat with more than one person at a time, just open another Google Talk window. To end the call, click the End Call button at the top of the Google Talk screen. If you don't end the call with this friend, the communication link between the two of you stays open, and you can start exchanging messages with this person again at any time. If you don't want to chat with your friend and instead want to send an email message, double-click the friend's name and then click the Email button that appears at the top of the screen; a new message to him is opened in Gmail. Complete the message as you would normally in Gmail (see Compose and Send Mail). If you're online and someone wants to initiate a call with you, a pop-up window appears at the bottom of your desktop, just above the System Tray. To accept the call, click the Accept button. To ignore the incoming call, click Ignore. From the point at which you click Accept, sending and receiving messages is the same as if you initiated the call.